I have explored guilt from many angles but lets hit it head on here. Well it is a normal human emotion that we all have, designed to be a learning mechanism that makes us re-examine our behaviour. Is there any point to guilt? It has a useful purpose in flagging up for us behaviour that isn’t ideal. For example, if I lost my temper and went a bit overboard in my criticism of another person (it has been known), then I would feel guilt afterwards. From that I would assess my behaviour and realise that in the heat of the moment I had said some less than useful things and apologise, so repairing the damage to the relationship. Or, if I ate a whole cake, meant for eight people (I am not admitting wether that has been known or not), then I will feel guilt as a way to tell me that actually it is not the healthiest behaviour for me. 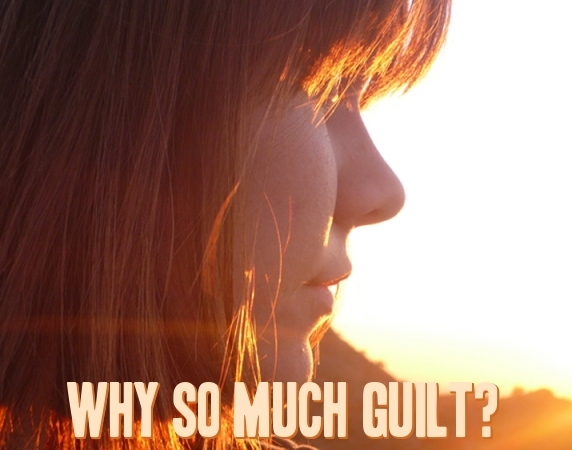 Why then is guilt a problem? Well, the problem comes when guilt is experienced at times when we haven’t actually got any control or made a mistake and so there is nothing to be learnt. This kind of guilt is ‘inappropriate guilt’ and it is very common, particularly in us as mothers. So why do we feel so guilty as mothers? We feel healthy guilt because we all make mistakes with our children and we use it to learn and change our behaviour. But I have seen a lot of ‘inappropriate guilt’ (lets call it ‘i-guilt’) in the mothers I have interviewed for my book. I spoke in-depth with women who clearly put everything they could into raising their children yet who still felt guilty that they were not doing it right or doing enough for their little ones. Some of us have a predisposition to feeling guilty, maybe we have learnt from our childhoods to carry round large doses of the stuff. But apart from that, what factors make motherhood such a breeding ground for i-guilt? Well these are the key reasons that I can come up with. As mothers we take on this huge responsibility for another persons life. Now more than ever we are aware that we have a big impact on how our children turn out. Gone are the days when parents see their role as mainly to physically care for the needs of their kids. We understand that it is more than that and with this understanding comes a deep sense of responsibility. We know that what we do impacts the people they will grow up to be. This is useful knowledge but it has its downside. It can lead us to consider the impact of every decision we make on our children, which creates that feeling of i-guilt about our choices, even though they are just that, a choice. We have a lot of choice now. It sounds great because we associate choice with freedom. But when we have to make so many decisions on a daily basis we can begin to question all of them, as if there is a right one. What type of nappies we use, what parenting style we adopt or don’t adopt, what classes we send our kids to, wether we work or don’t work and what food we give our kids are just a fraction of the choices we make. The funny thing about choice is that it has been shown that the more choice we have the less satisfied we are with the choices we make. Even if it is the best one, we find ourselves wondering how we can really be sure. Hence more twinges of i-guilt. So much i-guilt is based around our choices. We choose one thing over another and then feel bad. But if we made the opposite decision we would likely feel guilt too, as nothing is perfect. The idea that mothers are these angelic, eternally patient, utterly devoted individuals who need nothing for themselves, still exists in our society. It is the perfect mother fantasy. But as mothers are people with their own quirks and needs, we can find a tension between the reality and that myth. We have our needs that we must see too at some point yet we can so easily feel guilty when we put our needs into the mix (despite the fact that children do well with happy parents). Motherhood is a hot topic with so many opinions of the ‘right way‘ to do it. There is so much advice out there and much of it is contradictory. The ‘Should’ list for mums is huge and there is not one person that can jump the hoops and please all the experts, let alone families, partners, neighbours and passers by. If we are looking for a ‘right way‘ to be a mother then i-guilt is inevitable because there is not a one size fits all approach to motherhood. We love our children. We love them so much that we work so hard to do our best by them. Questioning ourselves is great and a much needed part of parenting. Carrying around oodles of i-guilt is not. If this sounds like you then next week I will be writing about Dealing with Guilt. I would love to hear your feedback on the things that cause you the most guilt as a parent and how it impacts you. Great thought provoking post, I know my biggest mum guilt moment was getting pregnant with my second child. Although he was planned from the moment I fell pregnant I was wracked with guilt about my first child no longer being my baby, 9 years on I don’t think it’s done her any harm but I still find things to feel guilty about every day! Hi Heather. I am glad you liked the post. Having another child is a big thing and does massively impact the older kids. They learn and grow through it. Life isn’t about having it all smooth and easy but rather it is about learning. I am interested that so many of you feel that the representations on the media play a big part in the guilt. Thank you for sharing that. I think some further research into it would be fun. Thanks for your comment. Seems guilt is a parenting plight. Maybe it is about the degree to which it impacts us rather than wether we have it or not, because it seems we all do. Likewise thank you for hosting it. I am hearing from everyone that they feel guilt once they have kids. Amazing isn’t it when we all work so hard. Hi Fran. I am glad this helped. You are so not alone in this. Part 2 is on its way on Friday. Glad to hear you have a new found positive attitude. That is great. Thanks for commenting. There is just so much to do and always something that needs our attention, so it is easy to fall into guilt when we can’t stretch ourselves thin enough. This is a great post! Yes Julie, I think you are right. It is easy for all of us to fall into the guilt trap. We just need to make sure it doesn’t get too powerful and we keep some perspective on it. Thanks for your comment. Hi Martha. We tend to associate guilt with being a working mum but not so. Being a stay at home mum produces plenty. For me I felt guilty that I wasn’t bringing in money. But I do know what you mean about the responsibility of being a stay at home mum. Everything is down to us and we feel we should be able to do it all but that is a not really possible. No one is employed to work with responsibilities 24 hours a day 7 days a week without breaks. It is still okay to get help as a full time mother in my book. Thanks for your reply. Brilliant post. I suffer from awful Mummy guilt sometimes over the smallest and most stupid things and find I just had to take a minute, detach myself from the situation and actually gain some perspective on it to see that I’m actually doing nothing wrong and have nothing to feel guilty about. That is great. I am in the midst of writing Part 2 and ‘perspective’ is one of the things that helps us deal with guilt. It is amazing how even small things can provoke this feeling. Thanks for your comment. Hi Angela, I am glad you don’t feel guilty any more. It is a big one to deal with being ill whilst having children relying on us. Being a good mother is all about doing the best with what we have and our attitude plays a big part in the way our children grow up to view their lives. Great to hear from you. I think we compare ourselves to the other ‘perfect parents’ and their happy children on Facebook who are doing lots of activities that we aren’t. Or maybe that’s just me! You are so right there. Knowing that we can only do what we can do brings that element of realism into play. We want to be perfect but there is no such thing and we cant be everything all the time. Thanks Christina for your comment. I like that. I genuinely thing it is about keeping it in check. We all have it and it is only a problem when it impacts our enjoyment of our role as a mother. The idea that we have more guilt when we have more options available to us is something I hadn’t thought of before but actually it makes a whole lot of sense! Superb insightful post. Hi Rachel, It is an interesting idea isn’t it. Choice is such a strange thing and we have so much of it now. The other thing they have found about choice is that the more choices we have the less able we are to take action (makes sense again). A choice of A, B or C is good. A choice of A to Z stops us in our tracks. It is the desire we have to make a good choice I guess like we want with our children, but it stops us deciding at all. Thank you for your comment. This is such a powerful and thought-provoking post. I’m certain lots of moms can identify with those guilt feelings. Thank you Jennifer for hosting and your compliments. Thank you for that. I am glad the aspect of choice rang true for you. I am about to post the next part, Dealing With Guilt and I would love to hear your feedback on the suggestions. It’s an interesting one with guilt and motherhood; and indeed the issue of more choice less satisfaction. I’m too accepting of my limitation to experience much of motherhood inappropriate guilt; there’s so much outside of my control as a mother and I’m learning to be okay with doing the best I can in the situation I am. And there’s so much happening all the time too, so I have to pick my battles as wisely as I can. It sounds like you are comfortable with your limitations (which we all have) and this frees you up to be the mother you are. You are right, so much is genuinely out of our control. Thanks for your comment. You are spot on there. for me those twinges of guilt are useful and a part of parenting. It is the degree of guilt that is the problem. Thanks for that. I agree that a degree of guilt has its place and keeps us from repeating behaviours we know are mistakes. I also agree that the degree of guilt that mothers take on these days is massive and paralyzing. I have to question your assumption that mothers have such an enormous impact on how their kids turn out. The research I’ve read and what I’ve seen from my identical twin daughters suggests that people are who they are. As long as we’re not actively abusing or neglecting our children, we have quite little impact on their personalities. What we can affect is their sense of their place in the world. I’ve been pretty good about keeping my mommy guilt manageable, but the three things that I still struggle with, knowing that the guilt is irrational are these: not carrying my twins full term (they were born at 33 weeks gestation), breastfeeding for only 7 months, and having a C-section rather than a natural childbirth. I suppose those all have in common being goals that I’d set and failed to achieve. My other goals have been more realistic: let the children know that they’re loved, encourage them to do their best, and recognize it when they do. Hi Sadia. This comment got stuck and so there has been a delay in replying. You make a valid point and it is the big question nature v nurture. My understanding as a counsellor and a mother is that we all have our own personalities. It is so clear having children that they are inherently themselves from day one. There were little tell tale signs in my boys as babies that were so clearly part of their personalities that we know now. As parents what we impact is how our children feel about themselves and to a certain extent how able they are to utilise their talents. We certainly don’t create our children in the sense of who they are (terminology is tough here). I feel guilty ALL the time about things I can not help, or know I have done my best to avoid or make better. It’s just one of those things. I think in this world we are led to believe that there is such thing as a perfect parent, and we’re forever striving to come close to it. If we feel we haven’t done something the ‘right’ way we do feel guilty. I’ve given up on that ideal now because it’s just not possible. You just have to learn to be ok with things. Thank you Jade. You might like my ‘Dealing with guilt’ post, which is out now, as I look at the methods we can use to reduce the impact it has on us. For me guilt is not all bad and it can be useful to acknowledge the good stuff about it too as well as limiting the negative side. Great post. We all know the guilt. I feel guilty for needing alone time, even when I’m sick and need to rest, I still feel guilty. If someone else would tell me this, I’d tell that person it is absolutely nessecary to take good care of yourself. And then I turn around and don’t to the same for myself. I know, it doesn’t make sense at all. Guilt is a tough one. Some of it is a natural part of motherhood because we consider our children in all things (and we need to be proud of that) but it can be driven by deeper feelings about ourselves. You might like to read part 2, which is out now on’Dealing with Guilt’. I am glad you liked it. Thank you for commenting Miep. Great read. I definitely fall into the category of the perfect mom fantasy and I am also one of those women you spoke about that give all they can to their children and still have a lot of mommy guilt. I rarely go out, have only blogging as my hobby (which I don’t get to do nearly as often as I like), but I am slowly letting go of the mommy guilt and realizing time to myself and time with just my husband is actually good for my children selfish of me. Thanks so much for the article. Interesting read. I think guilt is so much a part of motherhood for most of us but it is about keeping it in proportion and having a perspective on it. Part of that can be in accepting that you have guilt and it is because you genuinely care. It is a hard job being a mum. If you haven’t already read it then I have a Part 2 on ‘Dealing with guilt’ which looks at approaches to lessening its power. Thank you Alison for your great comment. Thanks for your comment. It is about giving it perspective and also realising that it is because we care.